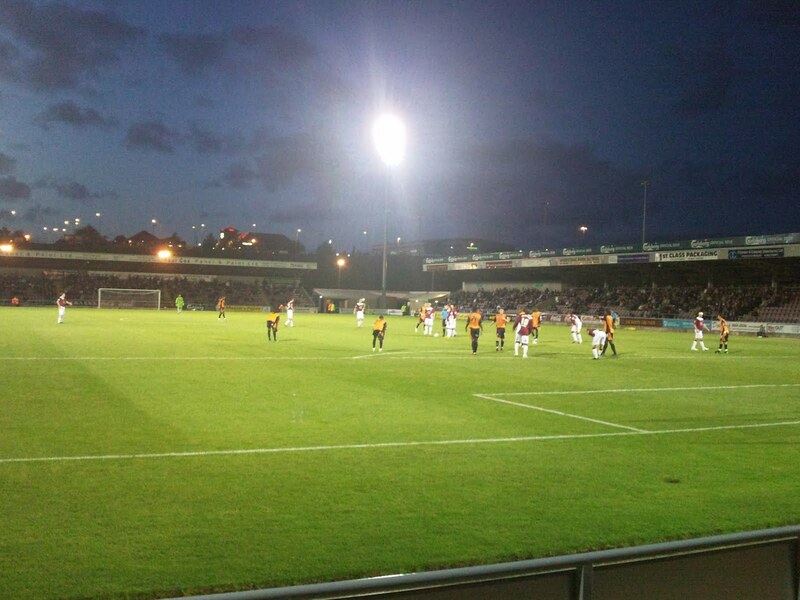 I don’t know about you, but I find there to be something really special about the beautiful game under floodlights. The atmosphere in and around the ground before the game itself is very different; in fact my whole match routine is very dissimilar to that of the average Saturday afternoon. With the visit of Andy Hessenthaler’s Gillingham to Underhill tomorrow night (which coincides with my first game of the season – once again my summer holiday clashed with the start of the season; hey, at least I have a real tan now! ), I thought I would look back at my favourite five games from seasons gone by, under the floodlights. The match that saw us go top of the league, albeit over night, as the game was played on a Friday. Undeservedly, we were losing at half time – Town scored after half an hour (against the run of play!). 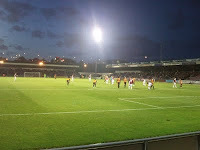 However, three second half goals (all in front of the Bees fans) meant the three points were heading back to North London and jubilation at the final whistle – with “we are top of the league” ringing around the Sixfields complex for minutes after the game. I remember it well – we completely dominated the second half, and to be honest, it could well have been more than three goals! The equaliser was an absolute beauty – a free kick from Ahmed Deen. The second, a volley from Paul Furlong had us all in raptures – another fine goal! And the game was over three minutes later, when after 70 minutes John O’Flynn joined in the scoring – a cheeky shot through the legs of the Cobblers keeper. Again, everyone went mental – and I can remember it clearly as one of my mates was on crutches at the time; the celebrations didn’t do his ankle any favours! It’s a shame the season pretty much went downhill from there, though! Certainly a game I’ll always remember, although it can’t be said it was that entertaining – despite over three and half hours of football! For the second season running, a win against higher places opposition meant a place in the fourth round of the FA Cup. Two goals for Billy Paynter – one in each net, in each half – sent the game to extra time and consequently penalties. The win, which amazing considering the difference in leagues of the two teams was made even more note-worthy considering we had 10 men for much of the second half and subsequent play. Michael Leary saw straight red for a challenge on a Swindon player who had to be stretchered off. The penalty shootout will be one I will always remember, although it certainly was no thriller! Swindon missed all of their penalties – and if I am correct, Beckwith made one save with their other attempts going high and wide of the target. Bristol Rovers (who beat Fulham in their tie – a shame!) at Underhill followed, where a loss incurred. A fourth round appearance in the FA Cup for the first time in the club’s history awaited as we beat a Championship Colchester side 2-1 at Underhill. Despite the U’s taking the lead, after half an hour of play – through Jamie Cureton of course – there was no real gulf in class between the two sides and we were unlucky to be behind at half time. With the likes of Bailey and Sinclair dominating the centre of midfield with their partnership, it was always obvious we were to equalise – and we did. A deflected goal from centre back Ismail Yakubu on the 62 minute mark and game on for the remaining half hour. From what I can remember it was end to end stuff with chances a plenty for both sides afterwards – the Bees dominating for the next 5 or so minutes after the goal, in the ascendancy. But Lee Harrison in the Barnet goal also was called for a number of saves. The winner came in the 80th minute – Jason Puncheon the hero this time with a 20 yard curler; Dean Gerken had no chance. Plymouth were the visitors in the fourth round, where we were, unfortunately, knocked out. Okay, so not a game we won, but a special occasion nonetheless. The magic of the cup once again pulling out one of those ties smaller teams can only dream about – Manchester United at the theatre of the dreams for us. 4,500 Barnet fans made the journey and the overall crowd was well over 40,000 – twenty times the average amount usually at Underhill on a Saturday afternoon! A game myself, or any other Bee will ever forget – unfortunately, probably for all the wrong reasons! 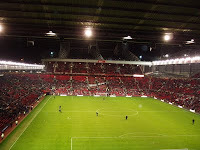 Ross Flitney was sent off within 90 seconds for handling outside the area – with young Louie Soares off and substitute keeper Scott Tynan on, his first job was picking the ball out of the net as United went ahead from a free kick. At half time it was 2-0, with Kieran Richardson also netting. Things could certainly have been different had Grazioli’s goal after 15 minutes stood, but alas it was offside. Manchester United made their class and extra player count when Rossi scored after 50 minutes. But Dean Sinclair, scoring in front of the United fans got a goal he’ll never forget, pulling back a mere consolation. 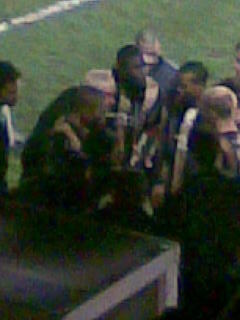 The match finished 4-1 with Sylvain Ebanks-Blake scoring a minute from time. Despite the scoreline, it was probably one of the best moments of my life and one I’ll never forget. Regardless of all the incident early in the game, the Bees fans never stopped singing and chanting and I’ve never seen an atmosphere like it. A win against your fiercest rivals is always good, no matter what competition it’s in – particularly as it’s a while since we have beat Stevenage! In fact the last time I saw a win against the ‘scum’, I was 14 and it came in the LDV trophy first round, where we won 3-1. With both sides playing weakened sides, it was clear neither was going to take the competition too seriously. The ever-popular Nicky Bailey opened the scoring after the break, from the penalty spot after a foul on him by the Stevenage keeper. Anthony Elding got the equaliser almost instantly for the visitors and despite constant pressure from the Bees afterwards, fair play to the Stevenage keeper that kept them in the game. However, the constant barrage of pressure paid off with Bailey getting on the score sheet again, capping off a man of the match performance – and also preventing the game from going to extra time. Lee Roache completed the rout within the five minutes of injury time, meaning the Bees entered the second round of the cup; as well as having the Hertfordshire bragging rights!